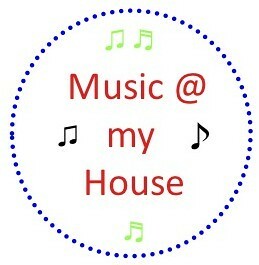 Have you ever lost a music book at your house? I've taught music lessons for about 15 years. And it seems to be a common problem. At our house I like to use "Montessori-Inspired" organization. In other words: accessible to my kids so they can practice taking responsibility for themselves in addition to practicing their music. 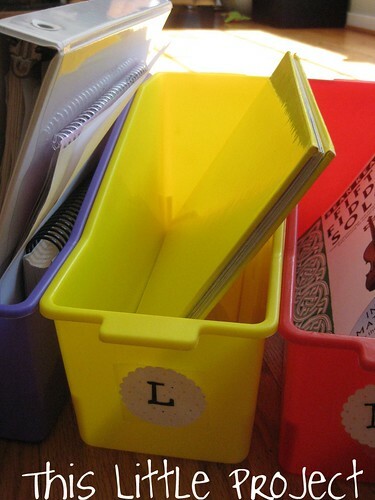 I recently got these bins from the Target dollar spot (for $2.50) with the back-to-school things. The tag on them says they are "locker bins" but when I saw them I thought, "Wow-those would be perfect for our music books!" So I bought 3 to try them out. 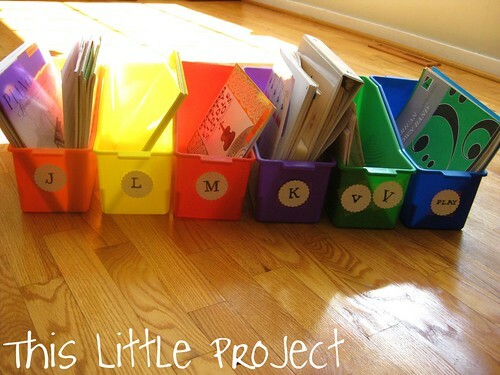 They are the perfect size and since they are longer than they are tall, they don't tip over like regular magazine box storage--which would be very frustrating for kids. 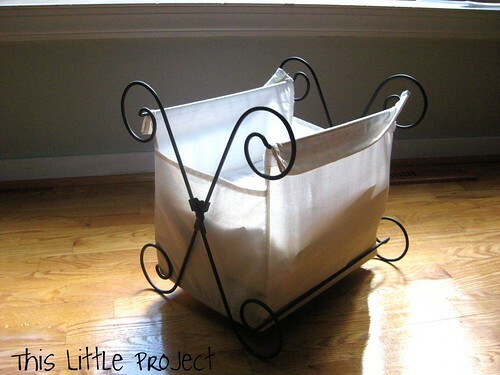 Also, they are heavy duty plastic and will hold up to daily use. I went back and got three more-one of every color! To label them I just punched paper, stickered on a monogram and did lazy laminating (packaging tape covering the paper punch) and they were ready to go. Ellie likes taking her tag on and off. These are kid friendly :) Ellie doesn't take lessons yet. 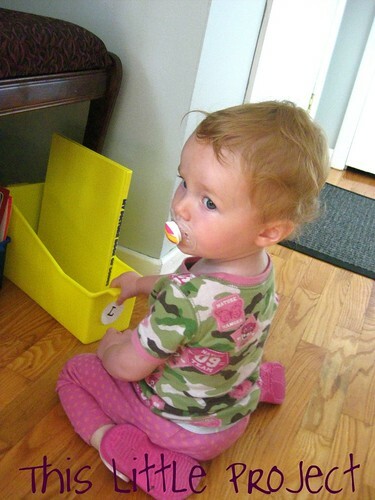 Her book and bin is to remind me to play and sing to her! These bins keep everything in one place: lesson assignments, practice records, music magazine, theory exercises, listening CDs, history reading, manuscript paper, as well as their books of music. It's also very easy for the kids to see what is inside these kinds of boxes so they like using them. 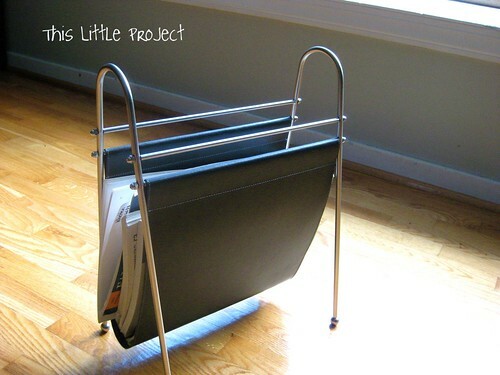 To give you some more ideas, I also love my steel and black leather magazine holder. I've had this for about 7 years and it is my favorite thing to keep right next to the piano for all the books that I use most. 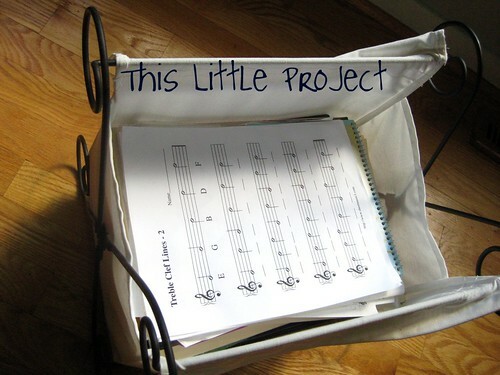 This is the other bin that I keep near the piano. It's metal and cloth. It's the perfect size for music books. 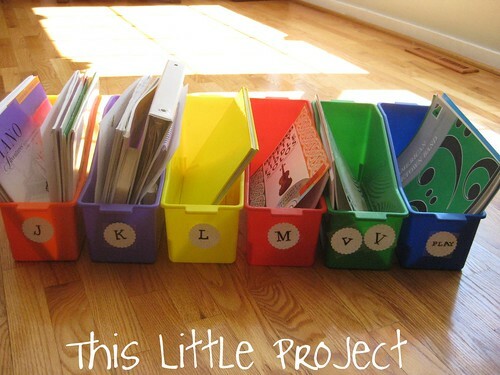 I like it because the books can either stand up in it or lay flat. It's nice to have a clear place for everybody's things. Here's to no more lost music books and fewer music books stacked all over the piano!